The Furia is a bridled C hybrid and seems very well constructed with heavy duty material on the leading edge, large portions of the wingtips and on the trailing edge, together with Aramid patches and strut bumpers. The kite is batten-less which helps to keep the weight low, and makes packing the kite away very easy. It's one-pump hence very quick to get on the water with and each strut interconnect has clips for safety, or to allow you to make the pressure of the LE different to that of the struts. There are 3 rear line attachment points which allow you to change the turning responsiveness, and 2 front ones to change both depower rate and bar pressure. The bar is as well thought out and comes with a plastic lined depower rope going into an aluminium centre hole, which should be great for prolonging its life and removes the worries related to using a bar with a wearing de-power line. Another thing which I was very pleased to see was the large chicken loop to make unhooking easy, and the loop locks into the bar when unhooked, so its nicely aligned to hook back in again. Its a pity theres no attachment point for handle-passes though. The bar also supports an extra safety line to one of the front lines which can simply be attached to with your safety leash, and each of the flying lines end in multiple knots allowing ease of adjustment at any point. The kite depowers via a mini cleat positioned just above the depower line, which works very well and comes with a velcro pad to attach the trailing end of the rope to, in order to keep it out of the way. The lines are 22m in length, which may be a bit shorter than most people are used to, but the kite connections are quite lengthy themselves, bringing the distance from bar to kite much closer to 25m. The bar also supports the ability to change the effective length from 45 to 55cm, allowing you to quickly adjust for different kite sizes. Once the kite has been inflated, one of the first things you notice is that unlike most kites it doesn't lie flat on the ground in the nose to wind position, but instead rests stably on the shoulders of the leading edge with a gap of a few inches between the centre of the LE and the beach, so as with all kites its wise to weight it down with sand. In the air the kite is very responsive and turns very quickly, the feedback through the bar is very good, despite the light bar pressure which can be adjusted to be greater via the pigtails. The Furia has a nice balance between the front and rear line tension, which allows you to feel the gusts through the bar and sheet out before losing balance or control. When you get going on the water the first thing you'll notice is the sheer pace at which you accelerate up to, which could be a real surprise for those who aren't used to a fast kite and makes the Furia not the most suitable for beginners. Upwind ability is impressive, and the wind range seems very good indeed. The 11m seemed very content in the light winds on the first day and the 7m did extremely well in the strong and gusty conditions on the second. The kite feels very stable when unhooked and is one of the best kites i've experienced for popping against. It also is very good for boosting big airs and also floats you down for the landing very nicely too. I'd usually comment about the water relaunch but unfortunately over both days I didn't get the kites wet once (which shows how nicely they handle). I did try a self launch from the beach which was very easy, and is usually a good indicator of how the water launch is likely to be. 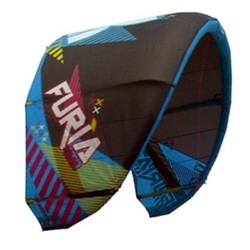 In summary, the Furia would be a great kite for any intermediates and beyond, with its high speed, agile turning, great pop, hangtime and depower together with many settings to fine tune it just how you want. I'm sure there will be a few freestyle purists that will be put off by the fact that the Furia doesn't fit the mould of a traditional unbridled 'C' shape, but they will be missing out as the Furia has a great deal to offer.